My aunt Margie was just 12 when she left the family coal miner’s cottage. No nearby school meant traveling to the dusty farming town of Fruita, Colorado where the hotelier’s family gave her room and board. Margie worked as a hotel maid, baby sitter and waitress to earn her keep until she graduated from high school. A friend landed her a job at the Jerome Hotel just as Aspen began to lift itself from the mining ghost town it has become. After beauty school she coiffed the locks of women in both Glenwood Springs and Aspen then married a WWII medic pharmacist. The couple later studied gemology and opened Glenwood’s Bo-Mar jewelry. As a young widow Margie operated the exquisite shop alone for years. My first watch, my first pearls and Jantzen sweaters for high school were her gifts. She didn’t cook much, but always relished peanut butter. She enjoyed the peanut butter cream pies I made when I lived with her one summer. And now I think of her with these tasty peanut butter balls. On September 20th family gathered at the Rosebud Cemetery in Glenwood Springs to lay a stone for Margie McMillin Peffer Beck 1920-2016. Leave those Reese’s cups in the Halloween candy aisle and roll some peanut butter balls instead. Good for breakfast or lunch with an apple and a great after school snack for kids. Place granola, powdered milk, sugar and raisins in food processer and whiz to pulverize. Add peanut butter and process to form a soft paste. (If peanut butter seems a bit dry add 1 tablespoon vegetable or olive oil). 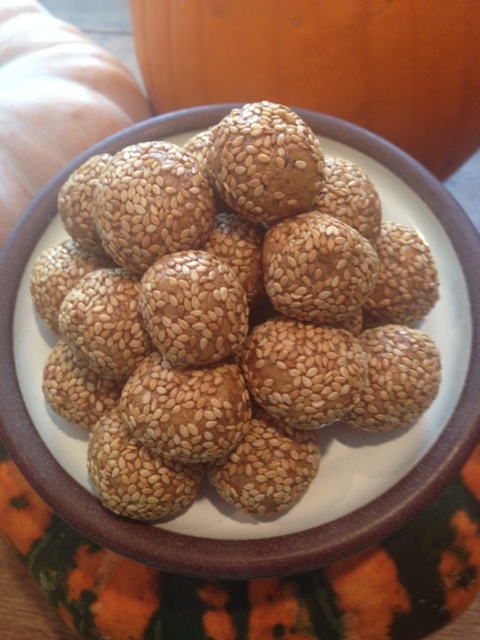 Place sesame seeds in a shallow bowl; roll each ball in the seeds and again roll between your palms to make sure the seeds adhere. Store at room temperature for a day or in the fridge longer. Makes 32 ½ oz. balls. You are currently browsing the Mary Jo's Kitchen blog archives for October, 2016.